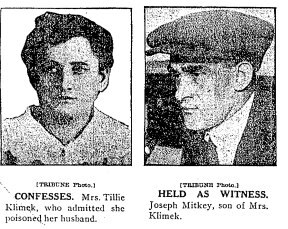 Until a couple of recent TV profiles, Tillie Klimek was nearly forgotten as a serial killer. While she was only convicted of one murder, police suspected her of many more. She was on her fifth husband (and had tried to kill him) when she was convicted of killing her fourth one, and it was believed that she had also killed some “friends” and neighbors – the number of people she had killed (or tried to kill) climbed up to 20. A couple of women even testified that they became deathly ill after eating candy that Tillie gave them – she may have single-handedly started the old “strangers with candy” story (though candy stores seem to turn up in a LOT old-time murder stories). The fact that she wasn’t hanged, but some people who barely qualified as accomplices in a single murder were, is pretty solid evidence that the “system” was broken already by 1923. 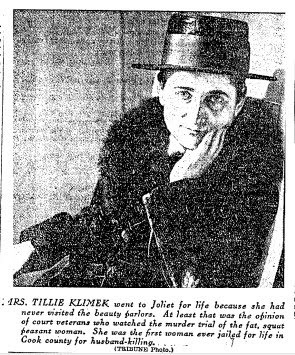 It as often pointed out in Tillie’s day that she probably would have been acquitted if she were more attractive (attractive women accused of murder generally were). I don’t know of any truth behind the oft-repeated story that she claimed to have precognitive dreams predicting people’s deaths, but she did cheerfully inform one of her husbands that he was going to die in three days after poisoning him, and even bought a bargain coffin to keep in the basement of her house. That house is still standing on the 900 block of N. Winchester – residents have described is as “creepy” and suggest that the bottom floor, where the coffin was stashed, is cursed – neighbors heard residents of that apartment threatening to kill each other occasionally). Even now, if you’re nearby and using foursquare, you can check into “Old Lady Tillie Klimek’s Haunted House.” We covered Tillie here before back in 2010. We’ll be looking into some of her other residences soon! Also held and tried was her cousin, Nellie Koulik. Nellie was eventually acquitted, but I’ve no idea HOW. Her own children testified against her. This is a list Tillie (and/or Nellie’s) possible victims. I’ve no idea how many of these stories about people getting sick are actually true. 1. Jospeh Mitkiewicz, Tillie’s first husband (arsenic found in body, had $1000 insurance policy, died 1914). Lived on Lubeck St (now Dickens Ave). 3. Frank Kupszyk, Tillie’s third husband (arsenic found – this is the murder for which she was convicted). Died 1921, had 1k in insurance. 4. Joseph Grantkowski, Tillie’s ex boyfriend, died in 1914 after “jilting” her. 5. Mrs. Rose Chudzinski, Tillie’s cousin. Died 1919 after attending Tillie and Frank’s wedding party. 6. Helen Zakrzewski, cousin. Died 1915, age 15. 8. Stelle Zakrzewski, cousin, died 1913 at 23. 10. Wojek Strummer, first husband of Nellie Koulik, died 1918, arsenic found (Nellie was a cousin of Tillie who was tried along with her). 11. Dorothy Spera, granddaughter of Mrs. Koulik. Died age 2. 12. Sophie Sturmer – daughter of Mrs. Koulik, died 1917. 13. Ben Sturmer – twin brother of Sophie, died a month after his sister. 14. 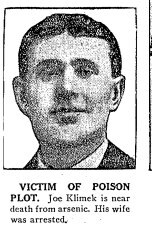 Joseph Klimek – last husband of Tillie, poisoned but recovered. 15. John Sturmer – son of Mrs. Koulic. Recovered when sick after father died in 1918, thought his mother poisoned him. 16. 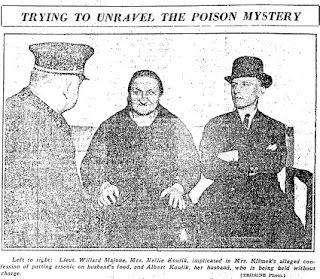 Mrs. Rose Splitt – says Tillie gave her poison candy after Joseph Klimek talked to her. 17. Miss Stelle Grantowski, sister of former boyfriend of Tillie. Got sick after eating candy given to her by Tillie after a fight. 18. Nick Micko, cousin, got sick of arsenic but recovered. 19. Mrs. Bessie Kupcyzk, sister in law of Frank K. Ill after eating at Tillie’s; recovered. 20. Miss Lillian Sturmer, 15, daughter of Mrs. Koulik. Lived at Mrs. Klimek’s home for a year at age 13; deathly sick from the food and still suffered heart trouble. (source: Chicago Tribune, March 14, 1923). above: Nellie, Tillie’s cousin, who was also in jail for year or so before being found innocent.